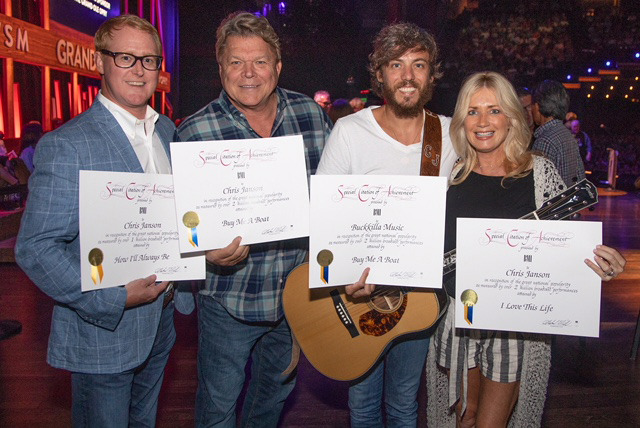 Chris Janson was surprised at the Grand Ole Opry last night (July 25) with three BMI Million-Air certificates just minutes before taking the Opry stage for the 138th time. Janson is the Grand Ole Opry’s newest and youngest living member, and he was recognized for his No. 1 single “Buy Me a Boat” (2 million), and two songs he wrote which were recorded by other artists: “How I’ll Always Be,” recorded by Tim McGraw (1 million), and “I Love This Life,” recorded by LOCASH (2 million). David Preston, BMI’s Senior Director/Creative, Nashville, presented Janson with the recognitions. “It’s so great to watch a guy, who I consider my friend, go from playing honky tonks in Nashville to playing arenas in front of thousands of fans. Chris Janson loves what he does for a living, and it shows in the way his fans respond to his music. He continues to release songs that connect with people and it’s no surprise that these cuts have reached such a high level of success,” said Preston. A Million-Air Award is given to songwriters, composers, and publishers whose songs accumulate over one million U.S. broadcast performances.